Trees and plants not only beautify our communities; they also play a vital role in keeping our environment healthy. However, there are many times when trees or forested areas need to be removed to provide space for roadway improvement projects. That is why the State Highway Administration (SHA) has established reforestation and planting programs and considers the protection of these natural resources a key part of SHA’s mission. Initially, we identify where trees and forests are located and how they might be affected by our work. This first step also includes determining if any trees or plants within a project area are rare, threatened, or endangered species. Special consideration is given to preserving these types of species. The next step involves reviewing a project’s design with the community and other stakeholders to discuss ways to avoid or reduce impacts. Sometimes trees need to be removed depending on the type of project. When this is the case, we follow applicable laws and regulations and make sure new trees are planted to replace those that are removed. 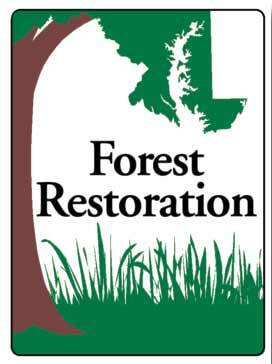 Beyond meeting legal obligations, SHA’s reforestation and planting programs focus on successfully restoring the quality of forested areas, ensuring a viable home for Maryland’s vast array of wildlife. These programs were also established to “green” the roads and highways in Maryland. The Million Tree Initiative was a great example of SHA’s commitment to reforestation. In 2009, SHA started working with other state agencies on the Million Tree Initiative with the goal of planting one million trees in Maryland by the end of 2011. SHA provided $800,000 funding through a Transportation Enhancement Program grant as well as planting-site reviews to ensure environmental requirements were met. By May 2011, the Initiative partners had exceeded the goal. A benefit analysis calculated that the million trees planted can absorb about 10 million gallons of polluted stormwater every year, preventing that water from entering the Chesapeake Bay watershed. As the trees grow, so do their environmental benefit: fifteen years from now, the mature trees have the potential to ‘scrub’ up to eight times more stormwater. Various communities throughout the state participate in our Partnership Planting program to restore flowers, trees, and other types of plants right in their own neighborhoods. If you’re interested in learning more or getting involved in a partnership program, please see the resources listed at the right side of this page or contact us at: planting@sha.state.md.us.